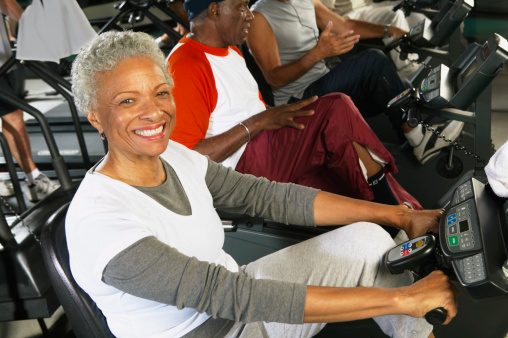 Where does the stigma of exercising at the gym over the age of 60 come from? On Mother’s Day, I had a long chat with my mother and mother-in-law about exercising. Both of them are fit, active ladies who participate in various forms of exercise. They were telling me, and maybe you can relate, how younger members of their gym classes would come up to them and say things like, “good for you”…as if the mere act of going to the gym over the age of 60 is something spectacular! I find a lot of the time people who are 60-plus get unfairly typecast when it comes to physical activity. It’s as though they should stay out of the weight room, spin classes, and Pilates studios and stick to walking and other “specialized” activities designed for older people. But fitness is all about what feels good to you—your age does not limit your options. The older you are, the more important exercise should be in your life. Retaining muscle mass and enhancing mobility are two of the biggest benefits of exercise to people over the age of 50, and regular exercise can improve bone strength, strengthen tendons and ligaments, and add elasticity to muscle. This results in a lower risk for injuries and improved physical capabilities. There are four basic categories of exercise; each one should be included in some capacity in everybody’s workout routine. The categories are endurance, strength, balance, and flexibility. — Endurance exercises are meant to increase breathing and heart rate. They’re also called “aerobic” exercises and include things like walking, jogging, yard work, cycling and swimming. Endurance exercises will make it easier to carry out everyday activities—whether it’s playing with your grandkids or making the bed—by improving the function and capacity of your heart, lungs and circulatory system. — Strength exercises involve some sort of muscle resistance training. They help strengthen your bones and muscles so you’re less prone to injury and are more independent and capable of performing everyday tasks like carrying groceries. You can build strength through resistance training with weights, resistance bands, or your own body weight. — Balance training can help you prevent falls and be more surefooted if you have a momentary lapse in footing. Try doing things like standing on one foot, tai chi, and a heel-to-toe walk. — Flexibility exercises help keep you limber and loose, while allowing you to move more freely during exercise and daily life. A few ways to increase flexibility include yoga, shoulder and upper arm stretches, and trying to touch your toes. There is some overlap when it comes to exercising; for example, strength training often involves balance. But trying to get in at least 150 minutes each week of cardiovascular exercise and two-three sessions of strength exercise per week—followed by stretching—is the best way to experience the benefits of exercise at any age. If you haven’t exercised in a while, it’s recommended you talk to your doctor before starting. Don’t let your age define your activity levels. Find exercise methods that you enjoy and surprise the younger folks around you!